Bella an 8 month old boxer mix, was surrendered to Animal Control in Philadelphia in horrible condition. The large and severe wounds on her back proved she was a victim of painful chemical burns. 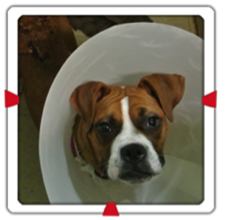 Bella required multiple surgeries and almost daily medical care to treat her wounds. Thanks to the hard work of the Saved Me Staff & volunteers, Bella is now healed and was adopted into a loving home on September 30th, 2015. Will you make a donation so we can save more pets with emergency medical needs like Bella? Copyright 2019 Saved Me Inc.